WASHINGTON -- They wore white. They shook their fists in the air. They carried signs reading: "No more children in cages," and "What's next? Concentration Camps?" 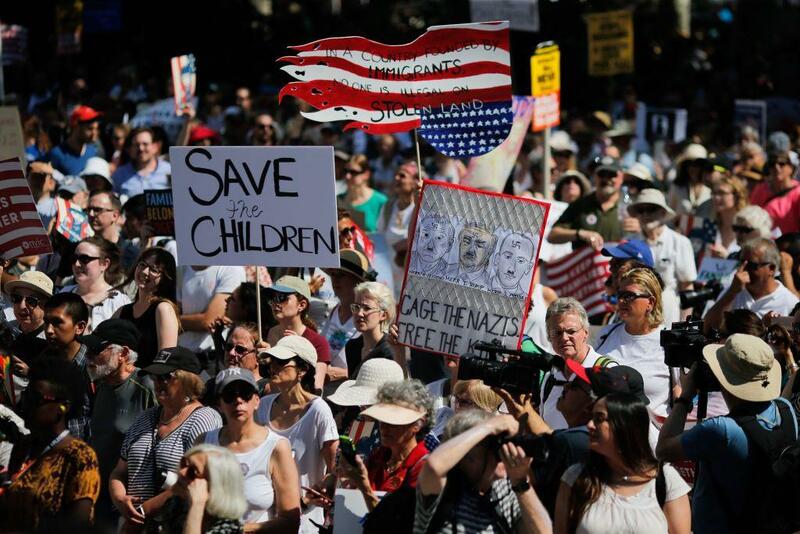 In major cities and tiny towns, hundreds of thousands of marchers gathered Saturday across America, moved by accounts of children separated from their parents at the U.S.-Mexico border, in the latest act of mass resistance against President Trump's immigration policies. Protesters flooded more than 700 marches, from immigrant-friendly cities like New York and Los Angeles to conservative Appalachia and Wyoming. They gathered on the front lawn of a Border Patrol station in McAllen, Texas, near a detention center where migrant children were being held in cages, and on a street corner near Mr. Trump's golf resort at Bedminster, New Jersey, where the president is spending the weekend. Mr. Trump has backed away from family separations amid bipartisan and international uproar. His "zero tolerance policy" led officials to take more than 2,000 children from their parents as they tried to enter the country illegally, most of them fleeing violence, persecution or economic collapse in their home countries. "You have people fleeing persecution and violence, put into military bases as if they're Osama Bin Laden or something," Faiz Shakir, the national political director at ACLU, told CBS News. "Please fight and continue fighting, because we will win," she said. The crowd erupted. Singer John Legend serenaded the crowd and Democratic politicians who have clashed with Mr. Trump had strong words for the president, including U.S. Rep. Maxine Waters who called for his impeachment. The president took to Twitter amid the protests, first to show his support for Immigration and Customs Enforcement as some Democrats called for major changes to the agency. Tweeting Saturday from New Jersey, Mr. Trump urged ICE agents to "not worry or lose your spirit" and wrote that "the radical left Dems want you out. Next it will be all police." In Mr. Trump's hometown of New York City, another massive crowd poured across the Brooklyn Bridge in sweltering 90-degree heat, some carrying their children on their shoulders, chanting, "Shame!" Drivers honked their horns in support. "It's important for this administration to know that these policies that rip apart families -- that treat people as less than human, like they're vermin -- are not the way of God, they are not the law of love," said the Rev. Julie Hoplamazian, an Episcopal priest marching in Brooklyn. "Fight for families," one sign demanded.ght-wing activists with the group Patriot Prayer also have a permit to march later in the day Saturday and the Portland Police Bureau said Friday they planned to have a heavy police presence. On Thursday, more than a thousand people and organizations including the ACLU, the ACLU of Texas and United We Dream gathered in Texas to demand that separated families be immediately reunited, the ACLU said in a news release. They gathered in Brownsville, which according to the ACLU is one of the "hardest hit" areas under the Trump administration's "zero tolerance" policy. "The administration doesn't have a plan to reunite families. But we have a plan," said Terri Burke, executive director of the ACLU of Texas. "We are going to keep fighting. Refugees are welcome here, immigrants are welcome here. We won't stop until every single child is reunited."